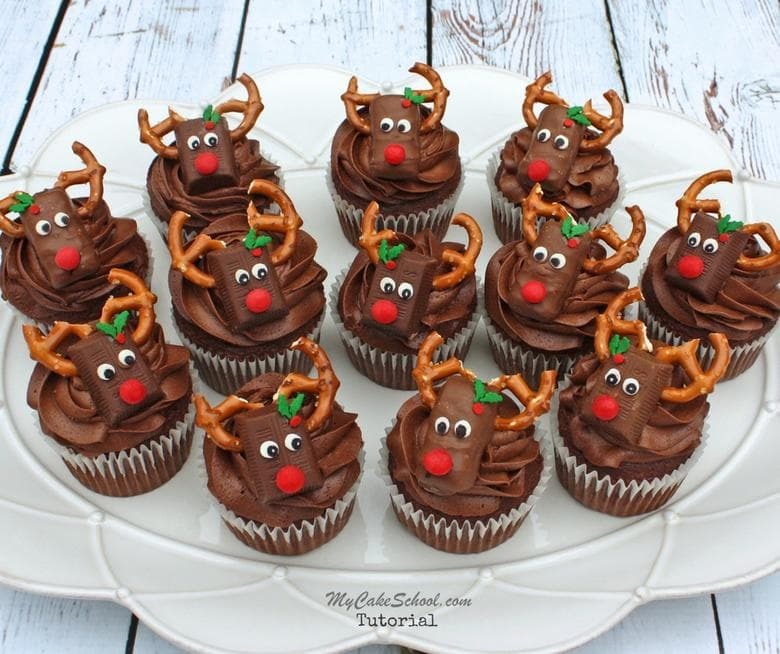 These CUTE and easy Reindeer Cupcakes are so simple and fun for the holidays! We’re combining mini candy bars, sprinkles, and pretzels into the most adorable reindeer candy bar cupcake toppers (if we do say so ourselves)! These sweet reindeer cupcakes are simple enough for beginner cake decorators, and kids would love to help assemble them too! Whether you recreate our entire platter of reindeer cupcakes, or just need a few for an assorted platter of Christmas goodies, they are sure to bring smiles. Brown/Chocolate Candy Melts or Bark Coating for "glue"
On a parchment lined cookie sheet, arrange two broken pretzel antlers side by side, pipe a bit of melted chocolate, and attach the chocolate bar heads. Add red sprinkle/candy noses with melted chocolate. Chill tray of reindeer for 10-15 minutes in freezer until melted chocolate is firm. Optional: attach holly sprinkle decorations to reindeer with piping gel or corn syrup (we used corn syrup) applied with a small brush. Swirl chocolate buttercream onto chocolate cupcakes with a 1M piping tip. Place the candy bar reindeer heads onto the cupcakes. You're done! As we mentioned in the video, you can use a number of alternatives for eyes. We went with sprinkles mainly because we were not working with vanilla buttercream and did not want to make a recipe just for the eyes. You could also use fondant eyes, pre-made google eyes, or simply draw on eyes as I did in the photo below from a previous tutorial. For the chocolate cupcakes, we highly recommend our Homemade Chocolate Cupcake Recipe, or if you prefer to work with cake mixes, this Doctored Chocolate Cake Mix Recipe is a great choice! 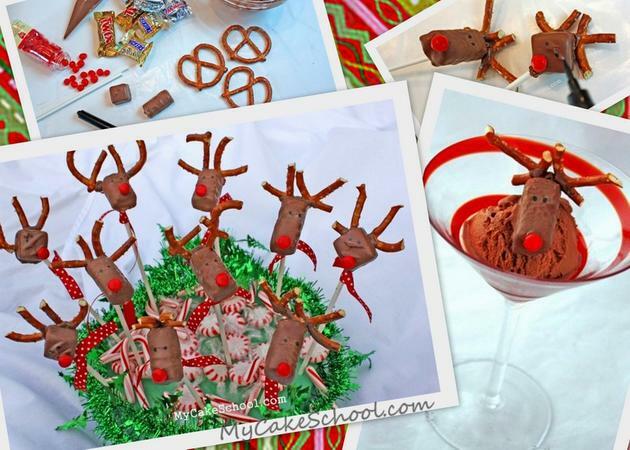 Years ago, we created a very similar candy bar reindeer design for a step by step Christmas blog tutorial, but our design involved adding them to lollipop sticks (rather than cupcakes) for a cute Christmas party dessert display. We still LOVE this idea, and they are perfect for those times when you just need a little something sweet (and cute) for a Christmas party. In the same tutorial, we also added a reindeer face to a scoop of chocolate ice cream for another fun & festive alternative! 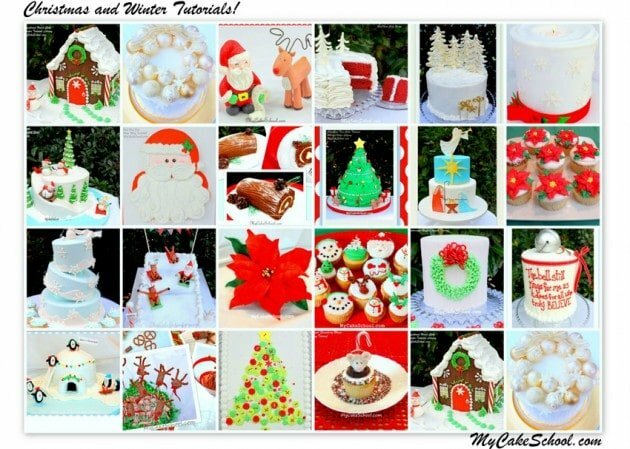 For more Christmas cake, cupcake, and recipe ideas, make sure to check out our Christmas Roundup! There are so many fun cake and cupcake designs to try! Thanks for stopping by! Remember that we have lots of Free Cake Tutorials and Recipes to share! Or, if you are interested in learning more about cake decorating, you should consider becoming a member of our site! Members of My Cake School have access to our entire cake video section, which means hundreds of video tutorials for decorators of all skill levels. We would love to have you! Click over for more details on Joining or Gift Memberships! I love these! Super cute! I told my son he could make some for me :-) He said “Sure, but they won’t look like that” LOL! 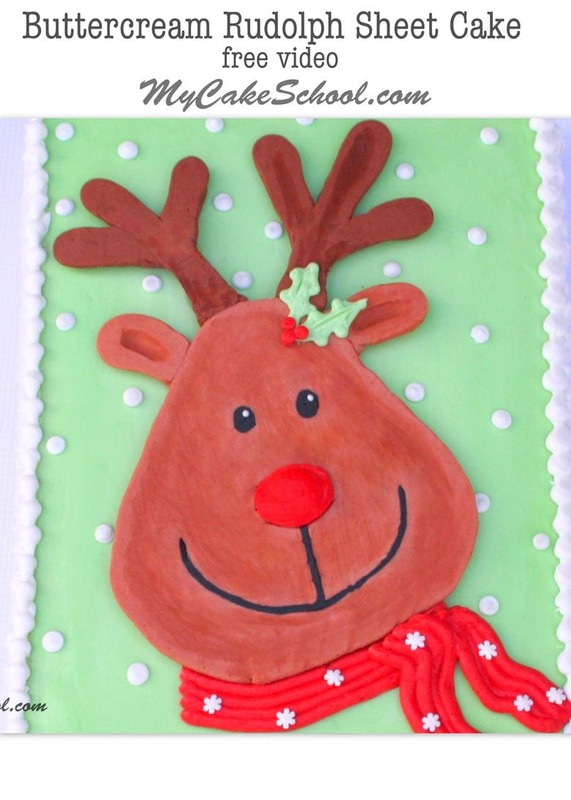 I guess he doesn’t carry the caking gene :-) Cute, simple & fabulous as always – thanks ladies – Happy Holidays! We have a nut allergy in family…is there a substitute for the chocolate candy bars. A plain chocolate substitute? Thank you for the adorable tutorial. Hi Rita, Twix miniature bars are chocolate and caramel. I don’t think they have nuts but the package or customer service could let you know for sure. 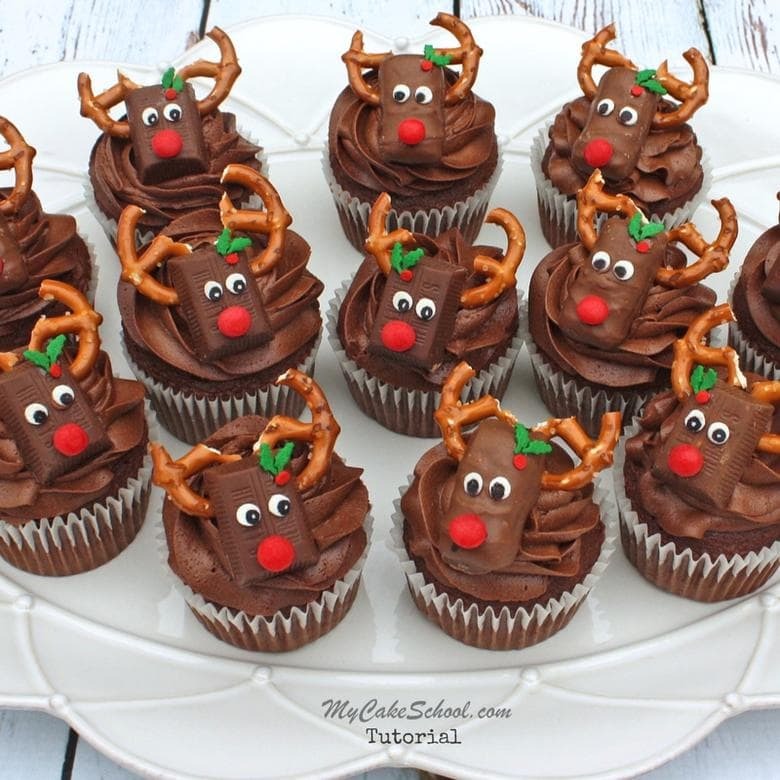 Also, You could use the chocolate swirl on the cupcake as the reindeer body, adding the nose, pretzel antlers, and eyes pressing them into the swirl of chocolate frosting. This would still be very cute and much quicker. Wow, so cute! And those teeny tiny holly leaves and berries?! What a great detail! I was going to set a table for the kids to decorate their own gingerbread men, but the kids would be over the moon for these. I might need to make both!